« Wedding Planning 101 – When and Where? The original post for this recipe came from http://thecookful.com and was used at the 2017 March/April Birthday Bash in Cedar Valley. In a large bowl, toss the flats and drumettes with the baking powder and salt. 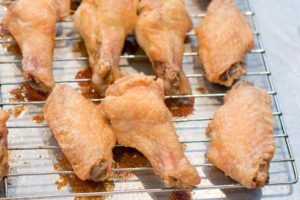 Place wings on the rack in single layer and cook for 30 minutes. After 30 minutes, leave them in there and raise the heat to 425°F until brown and crispy, 40-50 minutes.